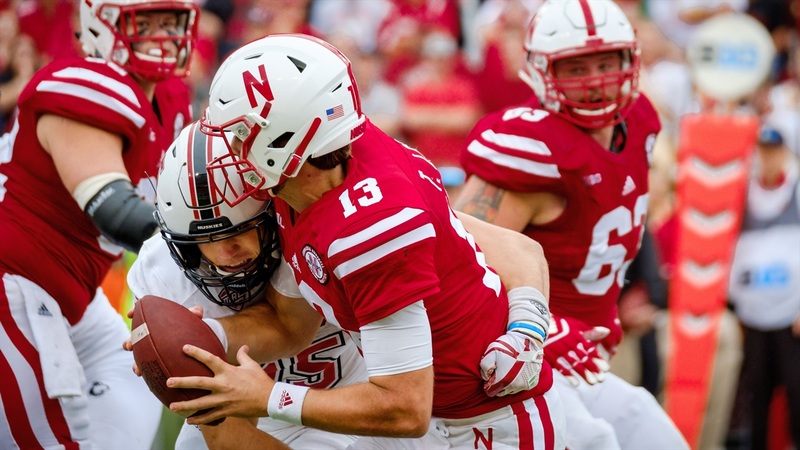 After Nebraska dropped a 21-17 game to Northern Illinois at Memorial Stadium on Saturday, I wrote about the offensive line being the source of Saturday's problems, and Coach Mike Riley echoed that assessment on Monday. 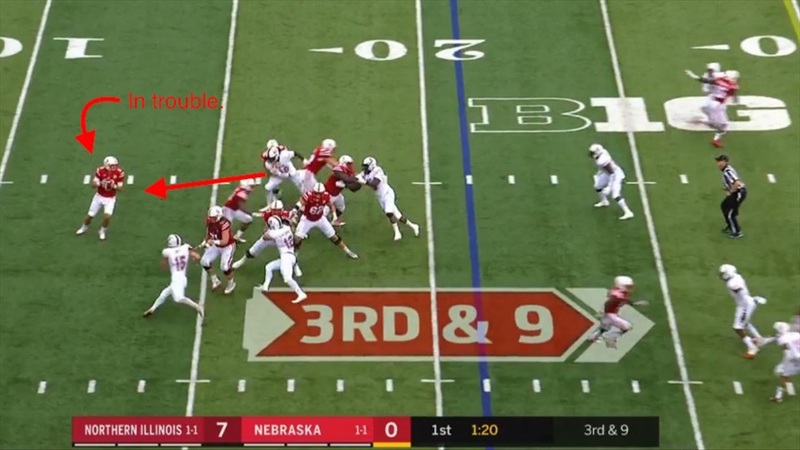 But why did Nebraska struggle so much in the trenches against a much smaller team? What exactly went wrong? In short, a lot of things. Let's dive into the tape. 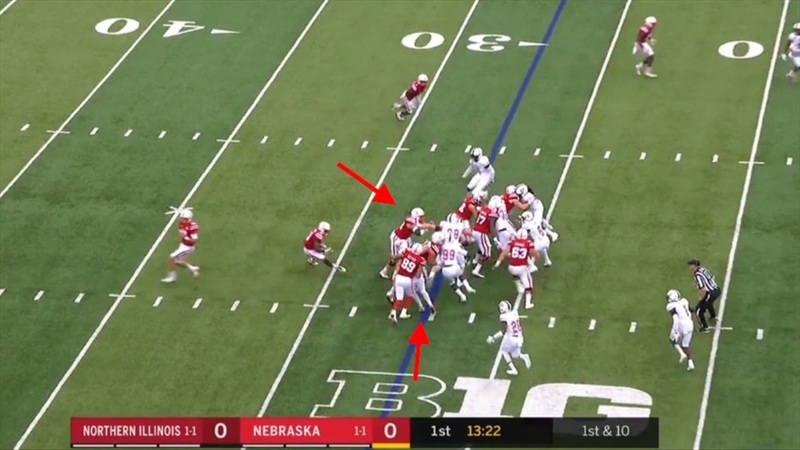 Nebraksa marched right down the field on the opening drive, but even before the pick-six there were issues. 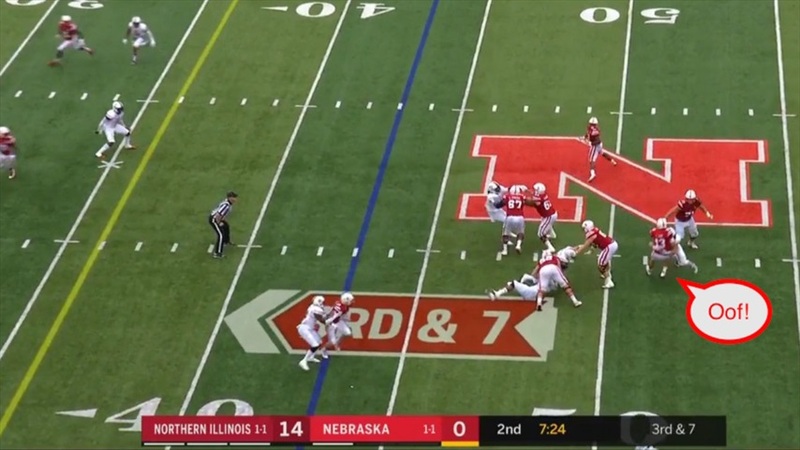 Midway through the drive, Nebraska had the ball on first and 10 and dialed up a run play for Mikale Wilbon. 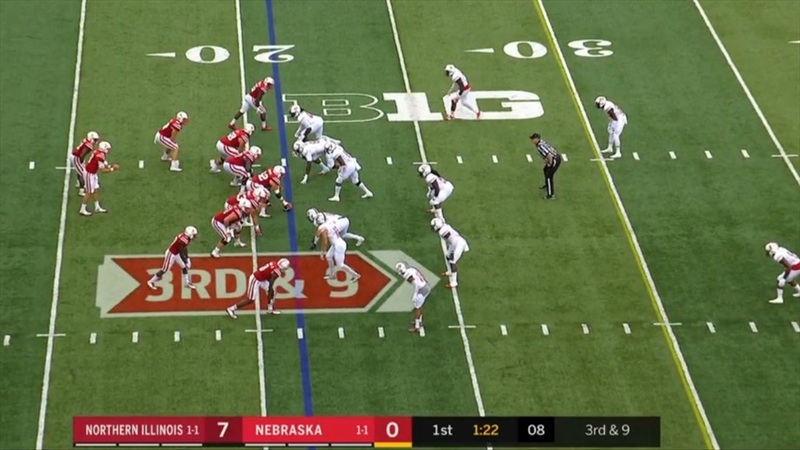 Nebraska set up in a heavy formation with two receivers to the left, one running back deep and everyone else on the line. Northern Illinois has plenty of men in the box. Off the snap, the left side gets some push but center Cole Conrad is moved back almost 2 yards. Meanwhile tight end Connor Ketter gets beat to the inside. With a free defender to the left side plus Conrad in the backfield, Wilbon looks to cut it back to the right side. Ketter's man shoots into the backfield and gets a hand on Wilbon, but the diminutive yet powerful running back spins to break the tackle. However, he's immediately met by another defender. Wilbon has no chance to break this tackle and is dropped for a loss of 1. 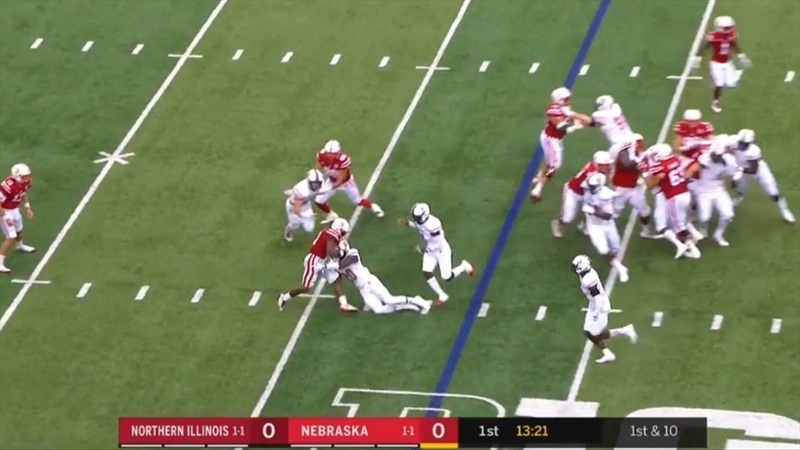 Northern Illinois had a good play call here on defense to be fair, but a couple players got beat off the snap and produced a negative play, setting the tone for the whole game. 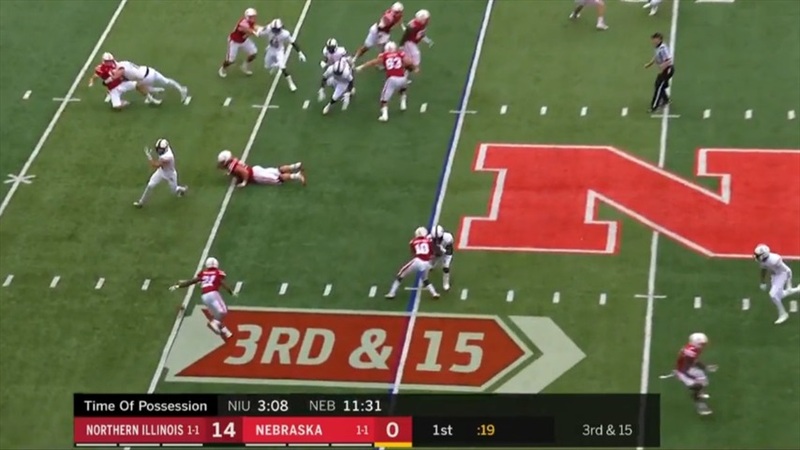 Nebraska picked up 11 yards on a pass to freshman Tyjon Lindsey on the following play to reset the chains, then returned to the run with Wilbon. The play proves to be successful, but not because of the blocking. 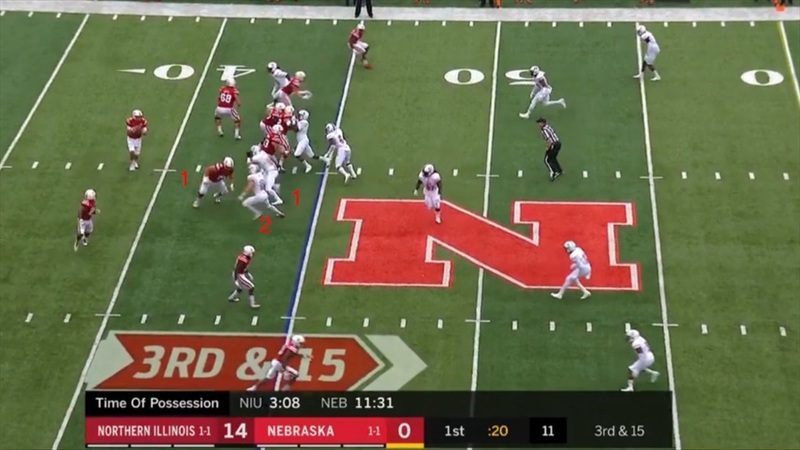 Nebraska motions into its bunch formation with two tight ends and wide receiver Gabe Rahn to the right side, which often signifies a run. 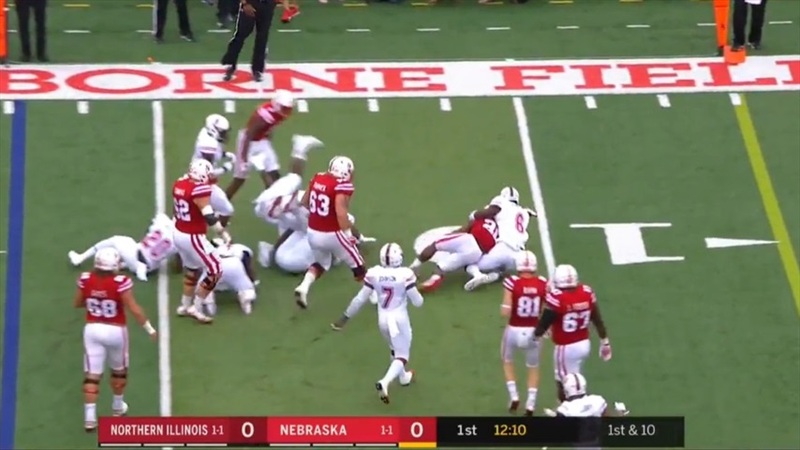 Right tackle Matt Farniok and Conrad were both man-handled on the play, forcing Wilbon to bounce it out to the left where Northern Illinois has a defender waiting. The defender should make this play; he gets two hands on Wilbon. However, the 5-foot-9 back runs right through the tackle attempt and turns a should-be loss into a gain. Wilbon's not done making Huskies looke like fools, however. He keeps those legs churning and runs through a couple of other tackle attempts. The Huskies finally get Wilbon to the ground after a gain of 7. 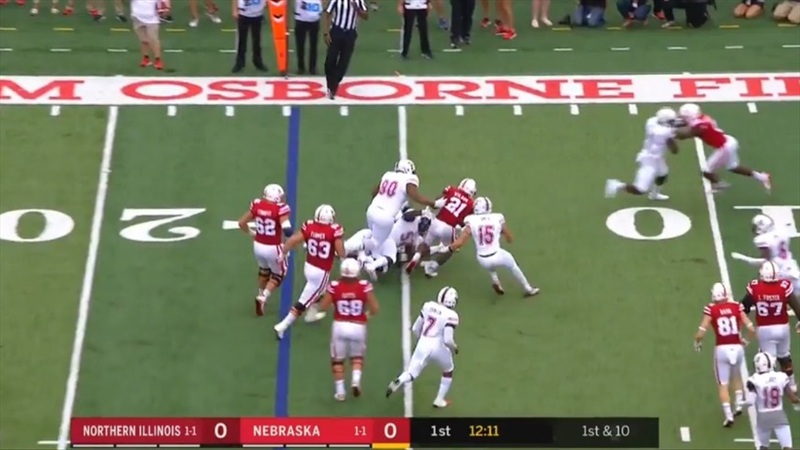 Two blockers got beat off the snap, but Wilbon's power and relentlessness turn what should have been second and long into a second-and-3 inside the 15-yard line (which Nebraska failed to take advantage of with the pick-six, unfortunately). 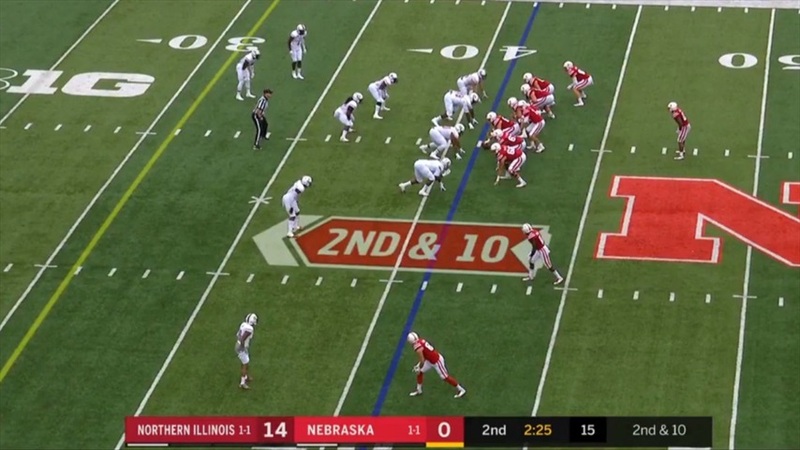 A third-and-2 should be a gimme for a team like Nebraska playing against a team from the Mid-America Conference, but that was not the case on Saturday. 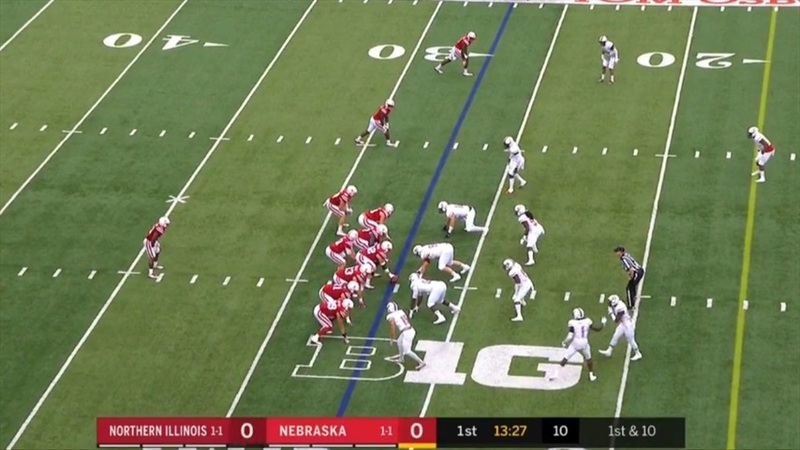 Nebraska lined up with heavy personnel and sent the one receiver on the field on a jet motion. Notice where left tackle Nick Gates is, because he'll be asked to block the defensive lineman who is lined up over the left guard. The defensive lineman rushes inside and Gates can't get in front enough to get the leverage to slow him down. Meanwhile, on the other side, William Lee easily sheds right guard Tanner Farmer to get some deep penetration. Wilbon manages to avoid Lee then tries to cut it back inside where there looks to be a small lane. 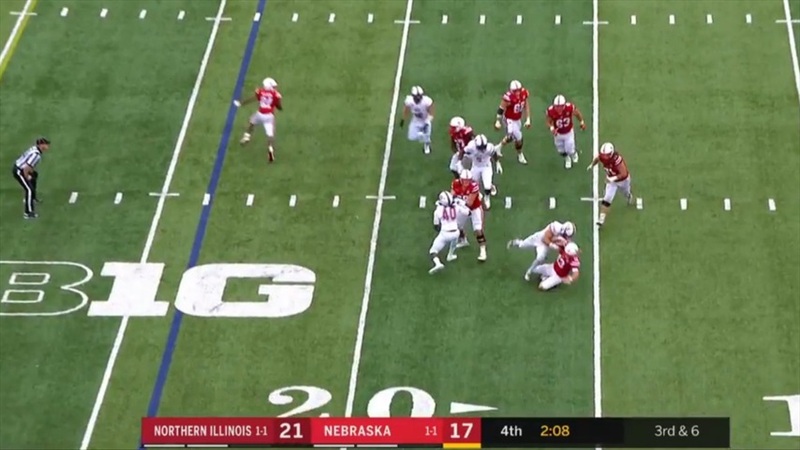 Tight end Tyler Hoppes allowed Northern Illinois defensive end Sutton Smith to spin off of him, but Wilbon avoids Smith as well. 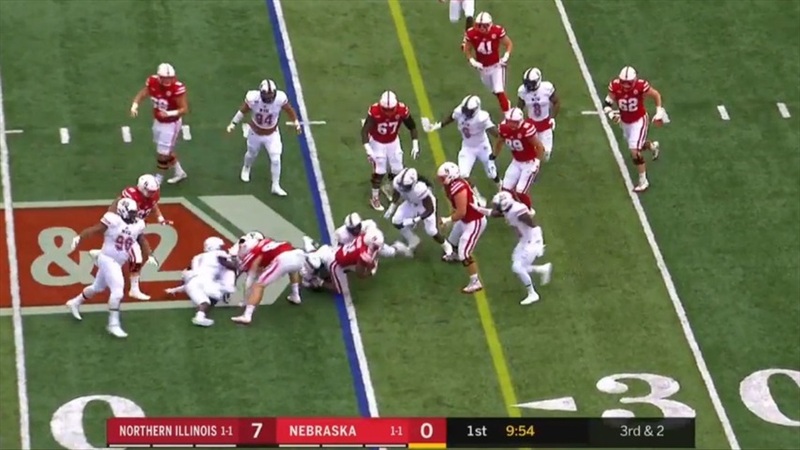 However, Conrad and tight end Conner Ketter can't sustain their blocks near the line to gain. Bobby Jones and Lawaun Johnson, the players who blew by Ketter and Conrad, make the play as Wilbon crosses the line of scrimmage. The final tally shows eight blockers for Nebraska. Five of them either missed or couldn't sustain blocks and a sixth allowed penetration early but recovered. We're not done with the first quarter just yet. 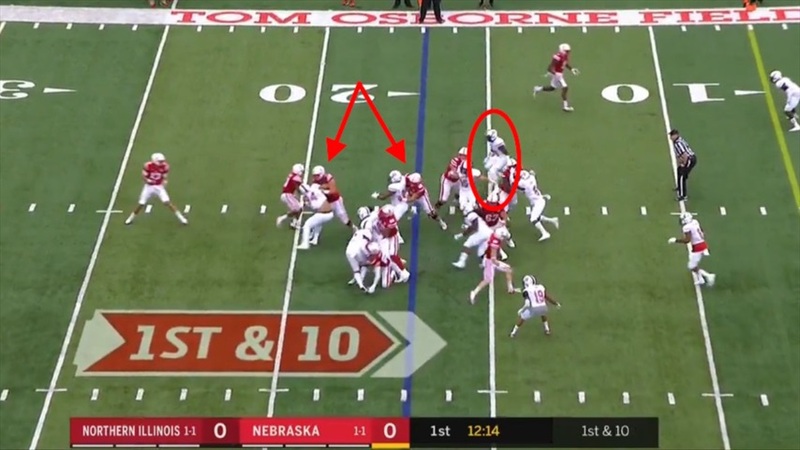 Nebraska had a couple of big gains negated by penalties – a hold on Farniok after he got beat by an outside rush and just fell on top of the rusher, and a block in the back downfield by left guard Jerald Foster on a screen pass to Wilbon that the running back likely would have turned into a big gain even without that particular block. 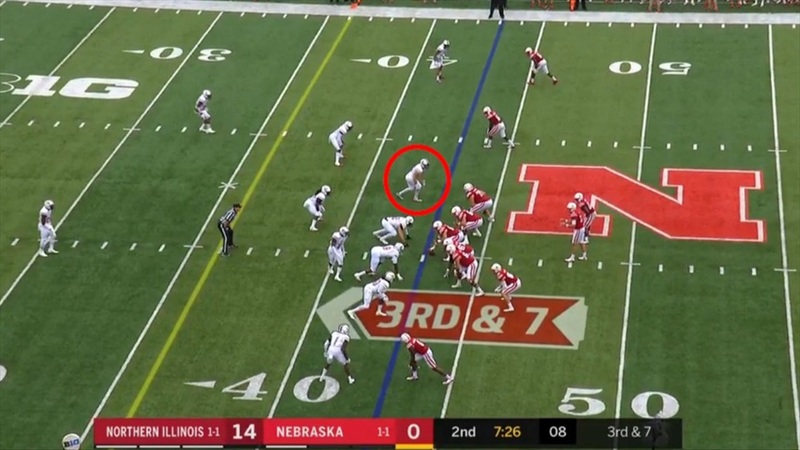 After all that, the Huskers faced a third and 9. 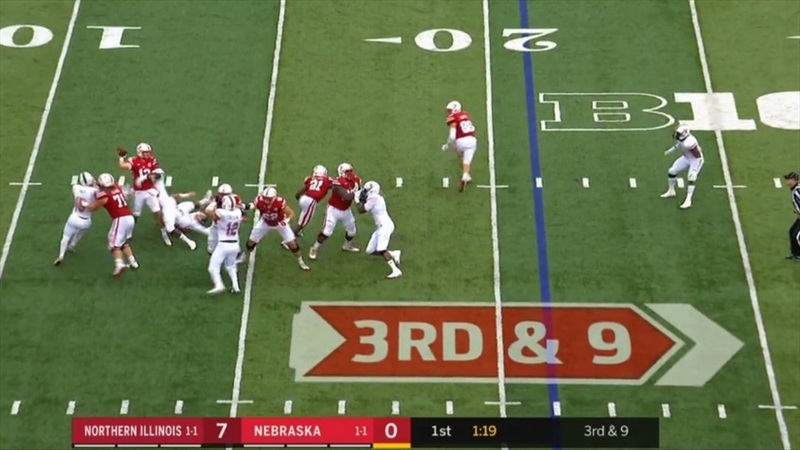 Nebraska has three receivers, a tight end and a running back all in tight. Gates signals something to Hoppes before the snap. 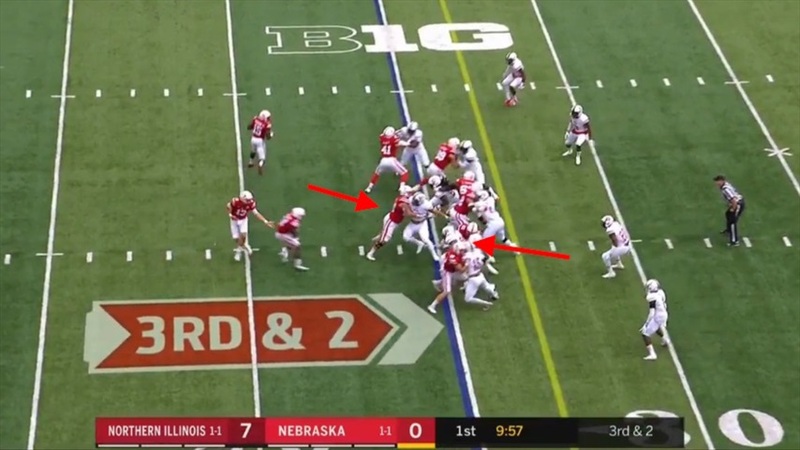 Northern Illinois only rushes four. Drequan Brown starts outside, putting Gates on his heels, then rushes inside. Hoppes is in position to help out Gates and pick up Brown, but instead he just barely chips him and releases to run a route. 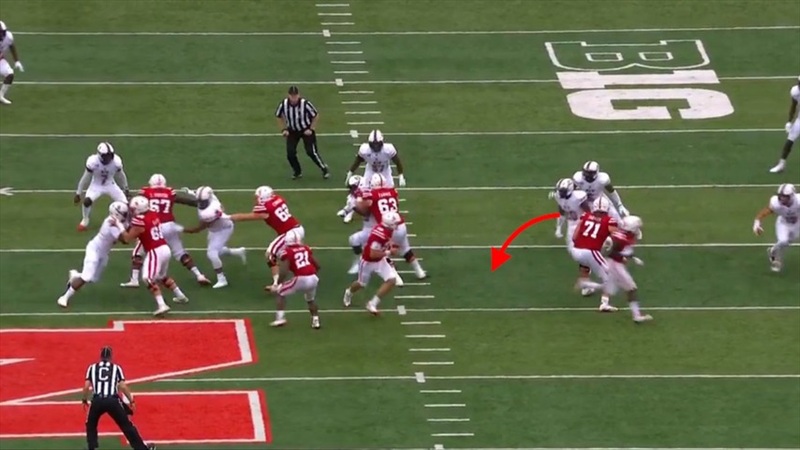 Brown has a clear lane to Tanner Lee as Wilbon steps up looking to provide help elsewhere. Brown drills Lee as he releases the ball and it pops up into the air. The ball falls into Johnson's hands and there's no one between him and the end zone. Touchdown. 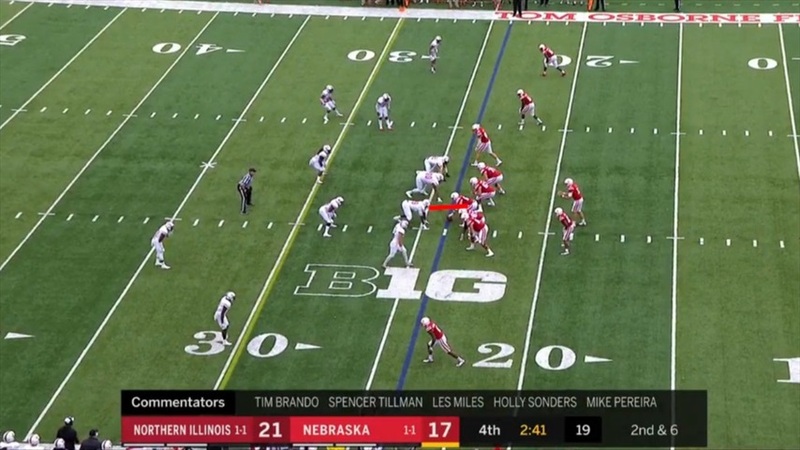 I'm not quite sure who was responsible for what, but between Hoppes and Wilbon Nebraska should have picked up that blitz even with Gates getting badly beaten. But wait, there's more! We still have one more play from the first 15 minutes. 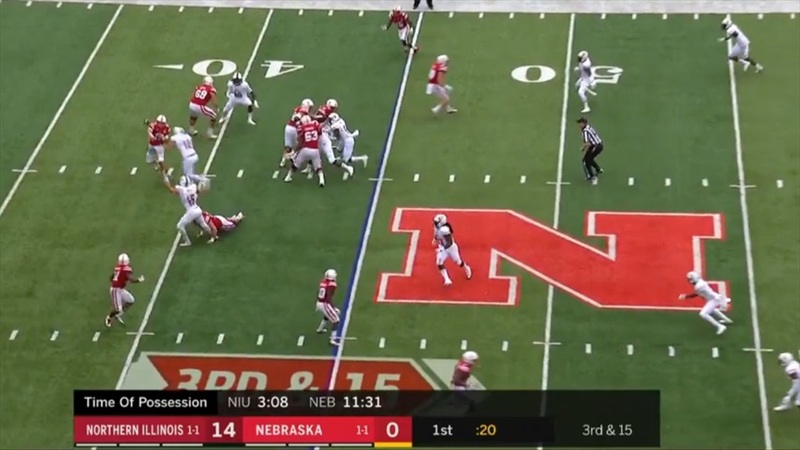 A false start by Foster, a run for no gain by Wilbon and a missed throw by Lee produce a third and 15 for the Huskers with less than 30 seconds to play. 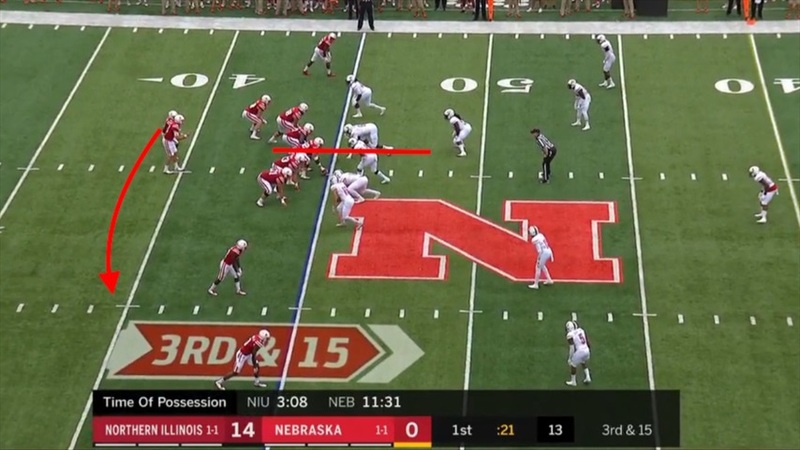 Notice how Northern Illinois lines up, basically man-to-man with the right side of the Nebraska offensive line. There is a man across from the center, right guard and right tackle. Wilbon is going to motion into the flat. 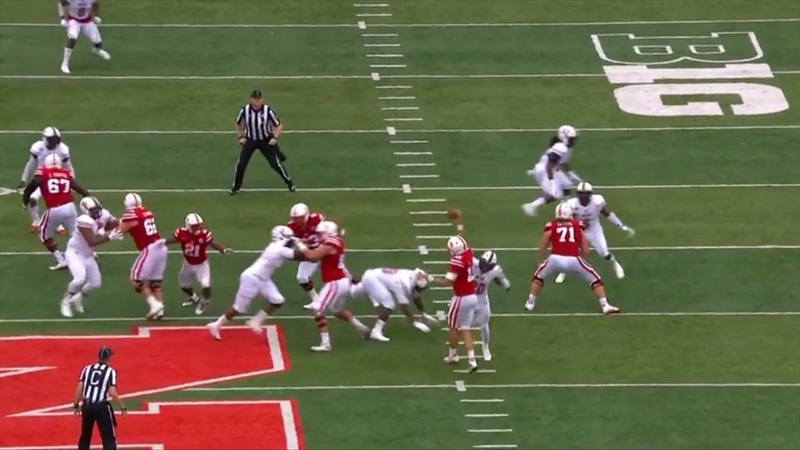 Nebraska slants to the left with four of the linemen blocking that way, including Farmer. That leaves two rushers for Farniok to deal with. For those of you that are mathematically challenged, two is greater than one. Farniok chooses to block the outside rusher, which is definitely the wrong choice. Though to be fair, I doubt the result would have been any different had he blocked the inside man and let the edge rusher go. Regardless, the pressure forces Lee to get rid of the ball too quickly (about a second after the snap). The ball falls incomplete behind Wilbon. 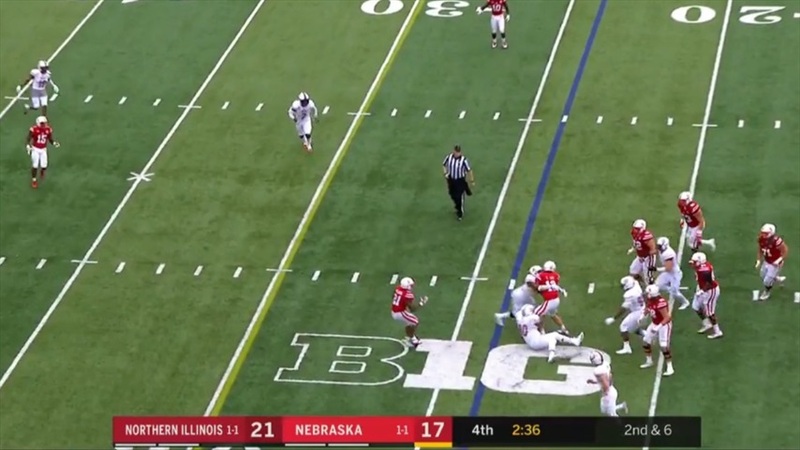 Nebraska is forced to punt the ball back to Northern Illinois. The whole blocking scheme was either busted on this play, there was some serious misreading of the defense or there was a big miscommuncation. Either way, after a nightmare first quarter, nearly everyone involved with blocking had messed up at least once. Let's move ahead to the second period for more pain. Nebraska faces a third and 7. 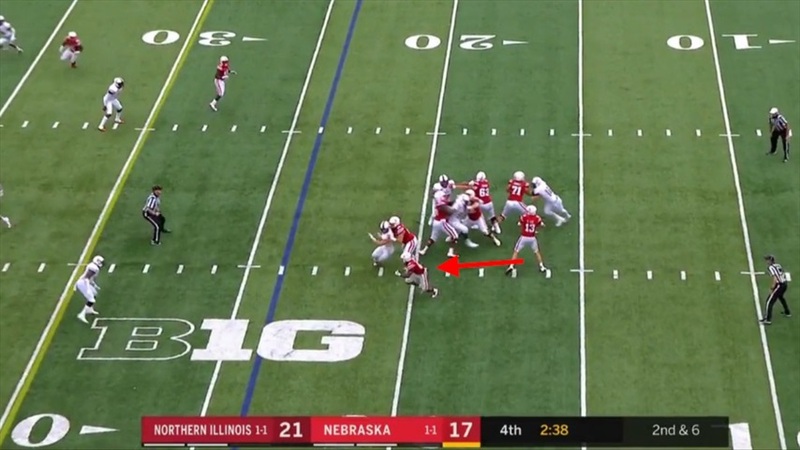 Smith, Northern Illinois's best pass rusher, stands up a full yard or two wide of Farniok at right tackle. 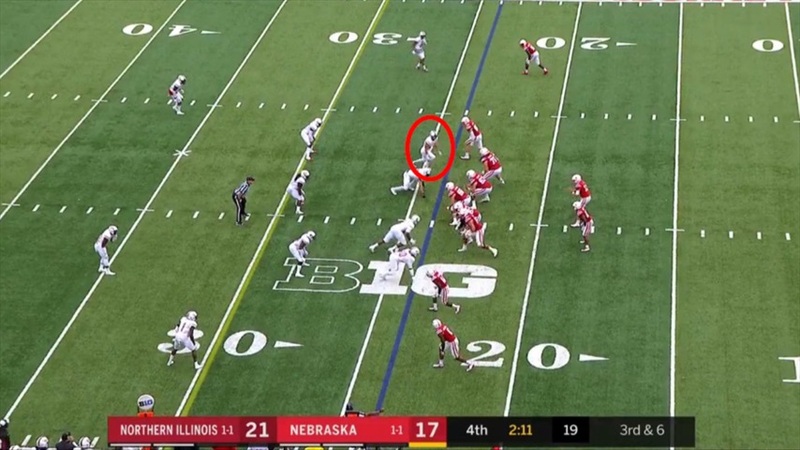 I circled Stanley Morgan Jr. below because I'm guessing he's Lee's first read, but he's pretty well covered here with a safety over the top as well, which you can't see here. Meanwhile, Smith gives Farniok an out-in-out move and blows by the young tackle. 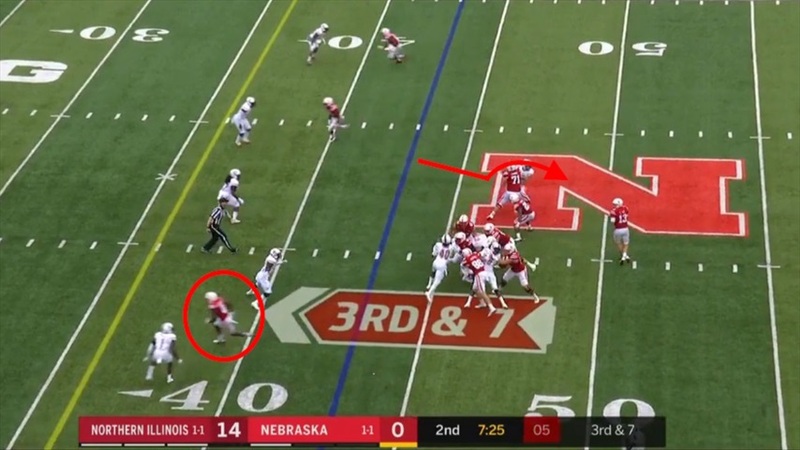 Farniok was one-on-one with Smith as there wasn't anyone in the backfield with Lee. Smith absolutely drilled him for a sack. On the next drive, a drop on first down led to second and 10. 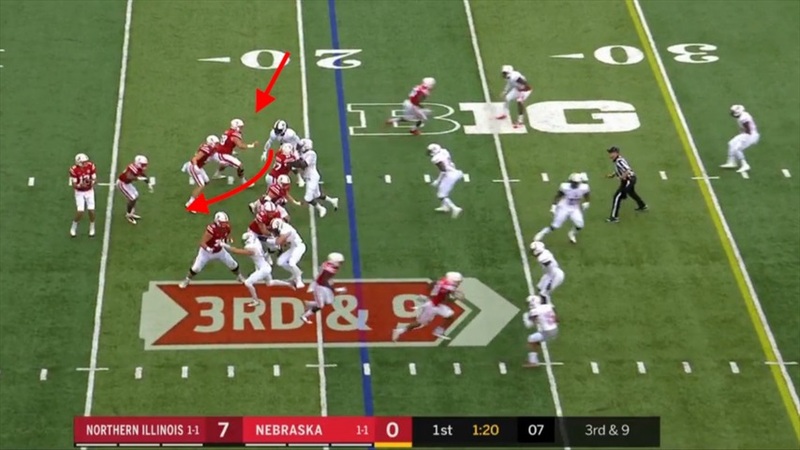 Nebraska lines up with two tight ends on Farniok's side, but both of them run routes rather than staying in to block. 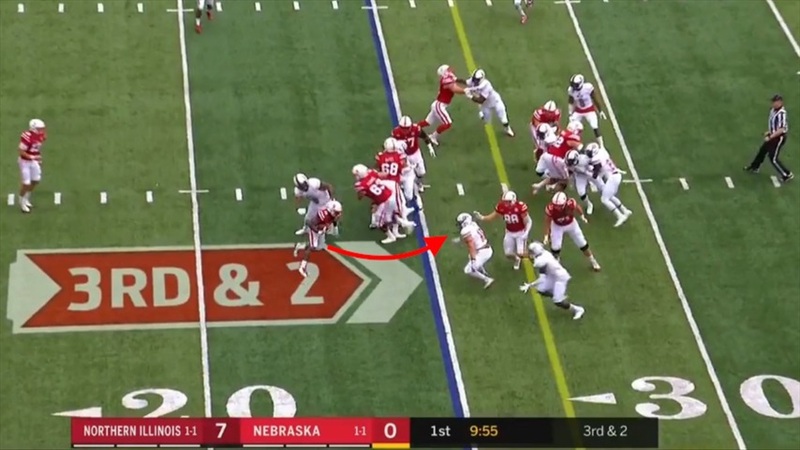 The line slants the protection left, but Farniok reads outside rush by the safety, Mycial Allen, and steps out too far, opening up a big hole for Allen inside. Allen gets a free shot at Lee and hits him as he tries to throw a screen pass, which didn't get enough time to develop. The ball bounces off the back of a Husky and falls incomplete. The play drew a "Farniok! Come on, big boy," from color analyst and Husker parent/fan Les Miles. I could go on, but I think I got the point across, for the most part. 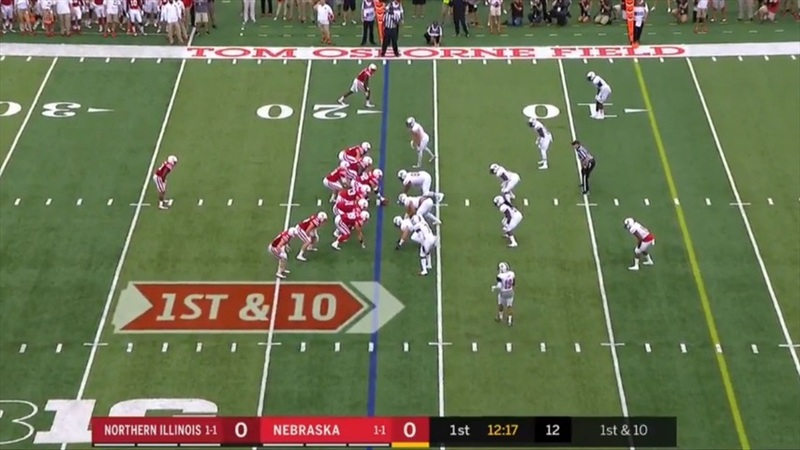 Let's fast-forward to Nebraska's final few snaps on offense. 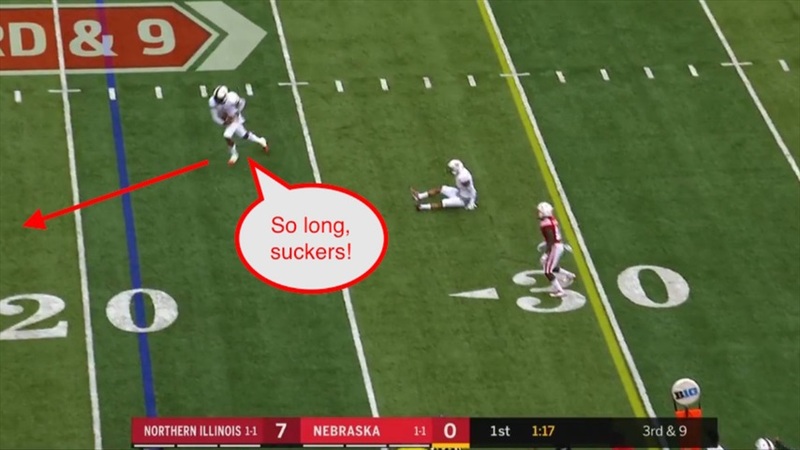 Down 21-17 with less than three minutes to play, Nebraska gets one last shot to salvage a win. Wilbon picked up 4 yards on a first-down run, setting up second and 6. Defensive tackle Ben Leroy lines up in the A-gap between Foster and Conrad. Leroy attacks the gap, Foster can't get him blocked and Conrad doesn't do much to help him. Leroy plows through to collapse the pocket and Lee tries to escape up the middle. It doesn't go well for him. The worst part is Morgan came open up the boundary sideline. Had Lee had a couple of seconds of protection, he might have been able to hit his favorite target for a big gain. Alas, he did not have those seconds and we move on to third down. 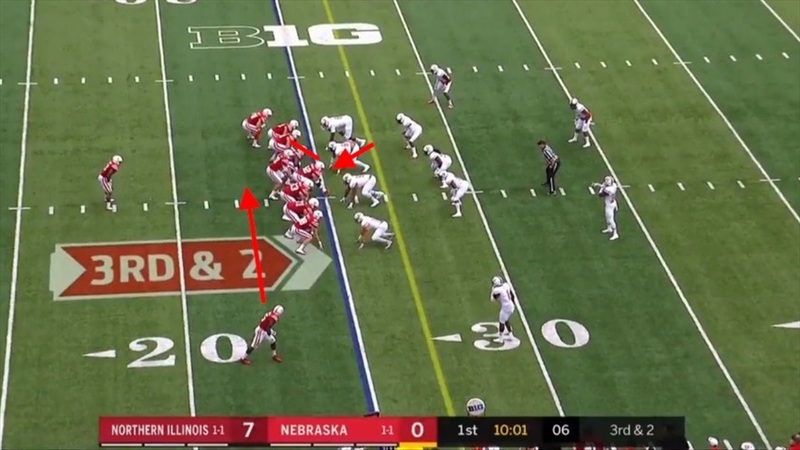 Northern Illinois only rushes four. Once again, Farniok is matched up with Smith coming off the edge. Smith went to the same move that had been working all game, the in-out speed rush, and in a shocking turn of events, it worked again. The receivers didn't have enough time to get open and therefore Lee didn't get enough time to get rid of the ball. Sack. Lee threw an interception on fourth down to effectively end the game. There is no doubt that Farniok followed up a solid first start with what was probably the worst performance of his football career. He popped up more often than anyone else during this post. 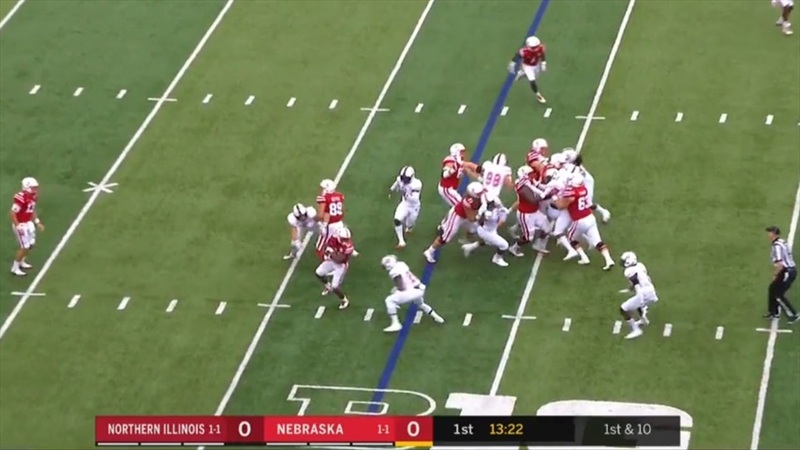 That being said, each player involved with blocking (except perhaps fullback Luke McNitt on limited snaps) failed throughout the game and the result is what we saw on Saturday. 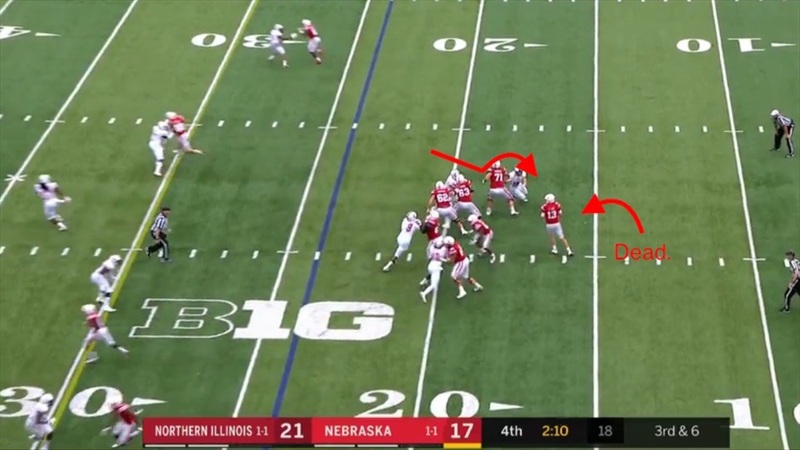 The other issue Cavanaugh mentioned was poor communication, and that was evident in some of the plays above where not everyone involved with the blocking scheme appeared to be on the same page. 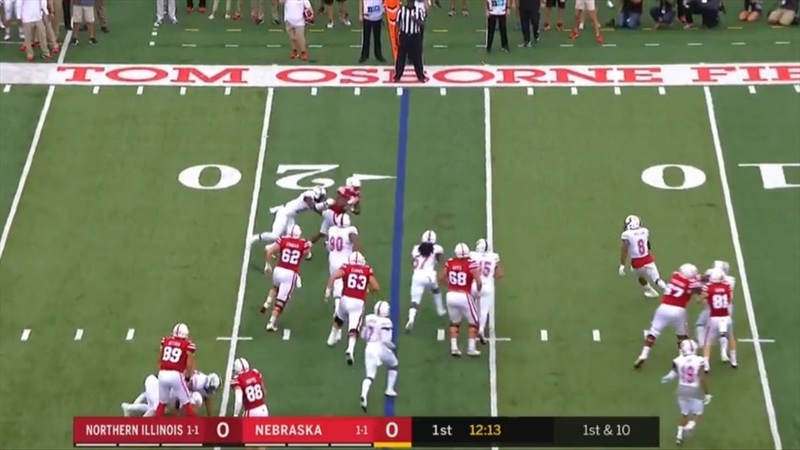 The Nebraska offensive line (and any other groups involved in the blocking schemes) has to do a much better job of everything if the Huskers have any hope of turning things around, and they'll potentially have to do it with their third right tackle in four games after Farniok added injury to insult with a broken wrist during the game.